Please note at until further notice we are unable to supply full oxygen cylinders, we are still able to supply cylinders unfilled. 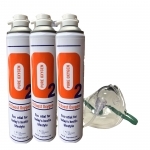 The Oxygenstore provide portable medical oxygen delivery systems include products that are equally suited for immediate care or mobile oxygen therapy. They includes a cylinder, regulator and oxygen therapy mask. A feature is that the regulator is permanently married to the cylinder, providing a user friendly, robust and low profile unit when compared with separate cylinder and regulator options. Under Paragraph 44, part 5 of Schedule 3 and the NHS GDS contracts regulations 2005 and the NHS Personal Dental Services Agreements Regulations 2005, Primary Care Trusts are entitled to carry out a visit of any practice premises where practitioners holding a contract for the delivery of NHS dental care are based. Part of the check list requires that you have a Medical Oxygen Cylinder with regulator capable of delivering a flow rate of at least 10 litres per minute on the premises with a reducing valve, flow meter, tubing, non-rebreathing oxygen mask & suitable connectors. Minimum size cylinder 340 litres. The check will ask is the emergency oxygen cylinder and regulator regularly maintained and whether the oxygen within the cylinder been renewed within 3 years? As a general sales list item controlled by the MHRA, we are unable to sell Medical Oxygen Cylinders directly to members of the public, we can only supply GP's, Dentists Veterinary Practices, or other suitably qualified Professionals, we may require a verifcation of purchasers qualification prior to the despatch of orders for Medical Oxygen.